Eels' Second Set of Teeth. This is a little ALIAN-esque, but interesting. Researchers say Moray eels have a second set of long, curved, canine-like teeth used for pulling prey down their throats. As the Moray eel feeds, a second set of jaws emerges from the throat to help the eel swallow its prey. 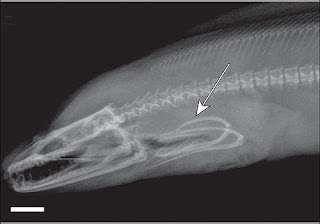 These radiographs from Nature depict the position of the pharyngeal jaws in Moray eels during prey transport. Once the Moray eel secures its prey with its first set of jaws, the pharyngeal jaws reach up (REACH UP!) from its throat, grabbing and pulling the prey down through its esophagus. Researchers used a slow-motion video camera to record a Moray feeding saw the pharyngeal jaws peek forward. When examined the researchers were surprised by the jaws range of motion. "What we discovered is that the pharyngeal jaws of Moray's have the greatest mobility of any pharyngeal jaws ever documented," Mehta says. Mark Westneat curator of zoology at the Field Museum in Chicago says it's common for fish to have a pharyngeal jaw when they lack teeth used for grinding food. 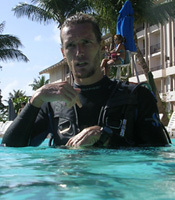 Westneat says the Moray eel's pharyngeal jaw is somewhat different. "Having a jaw in your throat that has long, recurved, canine teeth — and can actually shoot out of your throat into your mouth, grab a fish or something, and pull it down the throat — is highly unusual," he says.